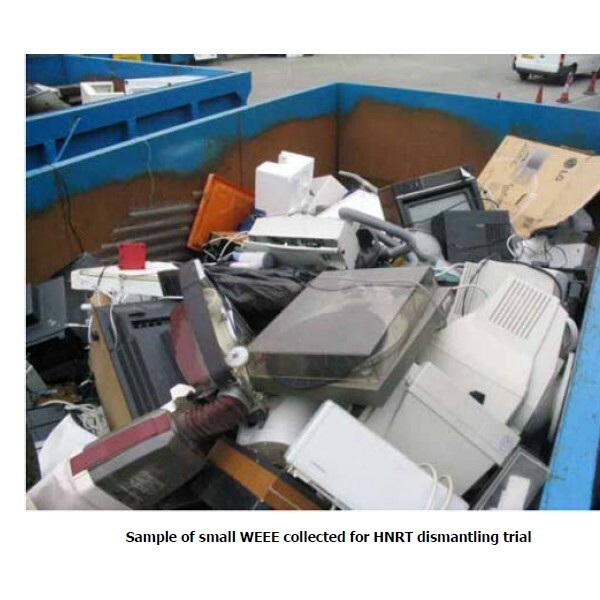 This final report summarises the practical trials and process design work conducted during a three phase project funded by WRAP to develop a process to separate brominated flame retardants (BFRs) from waste electrical and electronic equipment (WEEE) polymers. The work shows that the modified Creasolv1 process for extraction of brominated flame retardants from WEEE polymers has potential to be commercially viable in the UK context at a throughput of 10,000te/year. The Creasolv process was originally developed by Fraunhofer IVV in Germany and has been modified further in the course of this project in collaboration with Fraunhofer IVV. Brominated flame retardants are a group of chemicals that inhibit combustion. They are extensively used in electrical and electronic equipment, transport equipment, building materials, paint and insulation foams. However, many of the brominated flame retardants have undesirable effects on the environment and on human health. Therefore it is a nationnal target to substantially reduce the release of five prioritized brominated flame retardants before 2010 and completely eliminate the discharge of these five substances before 2020. The overall aim of this study is to perform a review of the current state of the knowledge on emerging “new” brominated flame retardants. This includes the use of the selected substances, environmental levels, data on toxicity and ecotoxicity, potential to bioconcentrate and bioaccumulate in the food web, analytical possibilities, potential for long range transport and their persistence in the environment. Further, this information is used to select compounds that based on the current knowledge can be relevant for further monitoring. This article was published in Polymer Degradation and Stability, April 2015. Influence of dispersion of clay in acrylonitrile–butadiene–styrene/nylon-6 (ABS/PA6) blends on flame retardancy was investigated. The results of FTIR spectra and transmission electron microscopy (TEM) showed that ammonium polyphosphate (APP) and clay were exclusively dispersed in the PA6 phase. Clay modified with poly (styrene-co-maleic anhydride) (SMA) was selective localization at the interface of blends. Introduction of clay and modified clay to blends caused the dispersion of clay not only in PA6 phase, but also at the interface. The flame retardancy was evaluated by limiting oxygen index (LOI), vertical flammability test, and cone calorimeter tests. For the blends with dispersed PA6 phase, the dispersion of clay only in PA6 phase or at interface had negative effect on flame retardant property. Morphology of residue char characterized by scanning electron microscope (SEM) showed that the inhibition of clay platelets on the expansion of residue char should be responsible for the deterioration of flame retardant properties. When clay dispersed both in PA6 phase and at the interface, the reinforcement of clay platelets on residue char caused the formation of compact and continuous superficial char, resulting in significant improvement of flame retardancy. In blends with continuous PA6 phase, introducing clay to blends caused the formation of compact and continuous superficial char thus improved the flame retardancy no matter where the clay dispersed in blends. The characterization of energy dispersive spectrometry (EDS) revealed that the morphology of char was determined by the dispersion of clay platelets in residue char.